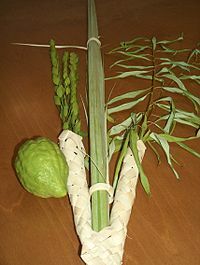 An important part of the Sukkot celebration involves the "Four Species". This is based on the scripture, Leviticus 23:40: "On the first day, you will take for yourselves a fruit of a beautiful tree, palm branches, twigs of a braided tree, and brook willows. You will rejoice before the Lord, your God, for seven days." 4. Myrtle - The myrtle trees they are speaking of have braided twigs. We have myrtles everywhere around here and they are not braided. You can order the four species if you need to. You will need three of these per person, the fresher the better. So those are the "Four Species" or "Arba Minim". Notice it is a total of SEVEN items needed. (1 etrog, 2 willows, 3 myrtles). There are SEVEN days of Sukkot, this is the SEVENTH month, and it is the SEVENTH feast. Seven, being the number of completion. It is said that the three Myrtle branches are so that each person has one for Abraham, Isaac, and Jacob. They are said to be visiting your Sukkah during Sukkot. The etrog: This bumpy lemon has a pleasing taste and a pleasing scent. It represents those who have studied the torah and perform the commandments (mitzvots). Palm Branch: Makes tasty fruit, but has no scent. This represents those who study the torah but do not do what it says. Willow - has neither taste nor scent. This represents those who don't study the torah and they do not do what it says to do. (You are at the Feast of Sukkot because you heard it was a party). On Sukkot, we are all brought together and united; bound together in one bundle and atone for each other. So, What do we DO with these Four Species??? According to the Zohar and the ancient writings, actions are needed and not just words. We wave these fresh branches to draw in the blessings into this world. (Think "as above, so below") As we are doing the earthly feast, there is also a heavenly feast. We want to wave these species, to bring in the blessings. You want them to be the freshest possible (I am thinking about growing my own etrog tree!). "Fresh" refers to their being full of abundance to draw blessing into the world. First, find EAST (thats where Jerusalem is!) Stand facing East. Put the Lulav in your right hand (the bundled branches). Have both hands together at your chest. "Blessed are you Lord, our God, Creator of the Universe who has sanctified us with His commandments and commanded us to take up the Lulav. Amen"
gently three times to the east (in front of you). This represents that God is everywhere. This is waved every morning during the Feast of Sukkot, during the morning service, the Water Ceremony, during the Hallel (Psalms 113-118). It is also used during Hoshana Rabbah.